Vitamin K is a group of structurally similar, fat-soluble vitamins that the human body needs for post-translational modification of certain proteins required for blood coagulation, and in metabolic pathways in bone and other tissue. They are 2-methyl-1,4-naphthoquinone (3-) derivatives. This group of vitamins includes two natural vitamers: vitamin K1 and vitamin K2. Vitamin K1, also known as phylloquinone, phytomenadione, or phytonadione, is synthesized by plants, and is found in highest amounts in green leafy vegetables because it is directly involved in photosynthesis. It may be thought of as the "plant form" of vitamin K. It is active in animals and may perform the classic functions of vitamin K in animals, including its activity in the production of blood-clotting proteins. Animals may also convert it to vitamin K2. Vitamin K2, the main storage form in animals, has several subtypes, which differ in isoprenoid chain length. These vitamin K2 homologues are called menaquinones, and are characterized by the number of isoprenoid residues in their side chains. Menaquinones are abbreviated MK-n, where M stands for menaquinone, the K stands for vitamin K, and the n represents the number of isoprenoid side chain residues. For example, menaquinone-4 (abbreviated MK-4) has four isoprene residues in its side chain. Menaquinone-4 (also known as menatetrenone from its four isoprene residues) is the most common type of vitamin K2 in animal products since MK-4 is normally synthesized from vitamin K1 in certain animal tissues (arterial walls, pancreas, and testes) by replacement of the phytyl tail with an unsaturated geranylgeranyl tail containing four isoprene units, thus yielding menaquinone-4. This homolog of vitamin K2 may have enzyme functions that are distinct from those of vitamin K1. Bacteria in the colon (large intestine) can also convert K1 into vitamin K2. In addition, bacteria typically lengthen the isopreneoid side chain of vitamin K2 to produce a range of vitamin K2 forms, most notably the MK-7 to MK-11 homologues of vitamin K2. All forms of K2 other than MK-4 can only be produced by bacteria, which use these forms in anaerobic respiration. The MK-7 and other bacteria-derived form of vitamin K2 exhibit vitamin K activity in animals, but MK-7's extra utility over MK-4, if any, is unclear and is presently a matter of investigation. Three synthetic types of vitamin K are known: vitamins K3, K4, and K5. Although the natural K1 and all K2 homologues have proven nontoxic, the synthetic form K3 (menadione) has shown toxicity. Vitamin K1 was identified in 1929 by Danish scientist Henrik Dam when he investigated the role of cholesterol by feeding chickens a cholesterol-depleted diet. After several weeks, the animals developed haemorrhages and started bleeding. These defects could not be restored by adding purified cholesterol to the diet. It appeared that—together with the cholesterol—a second compound had been extracted from the food, and this compound was called the coagulation vitamin. The new vitamin received the letter K because the initial discoveries were reported in a German journal, in which it was designated as Koagulationsvitamin. The MK-4 form of vitamin K2 is produced via conversion of vitamin K1 in the testes, pancreas, and arterial walls. While major questions still surround the biochemical pathway for the transformation of vitamin K1 to MK-4, the conversion is not dependent on gut bacteria, as it occurs in germ-free rats and in parenterally-administered K1 in rats. In fact, tissues that accumulate high amounts of MK-4 have a remarkable capacity to convert up to 90% of the available K1 into MK-4. There is evidence that the conversion proceeds by removal of the phytyl tail of K1 to produce menadione as an intermediate, which is then condensed with an activated geranylgeranyl moiety (see also prenylation) to produce vitamin K2 in the MK-4 (menatetrione) form. Menaquinone-7 is different from MK-4 in that it is not produced by human tissue. MK-7 consumption has been shown to reduce the risk of bone fractures and cardiovascular disorders that are crucial health issues worldwide. Recently, leading research teams from Australia, Japan, and Korea are broadening the understanding of MK-7 and its production. It has been reported that MK-7 may be converted from phylloquinone (K1) in the colon by E. coli bacteria. However, bacteria-derived menaquinones (MK-7) appear to contribute minimally to overall vitamin K status. MK-4 and MK-7 are both found in the United States in dietary supplements for bone health. The U.S. Food and Drug Administration (FDA) has not approved any form of vitamin K for the prevention or treatment of osteoporosis; however, MK-4 has been shown to decrease the incidence of fractures up to 87%. MK-4 (45 mg daily) has been approved by the Ministry of Health in Japan since 1995 for the prevention and treatment of osteoporosis. and leuprolide treatment (for prostate cancer). The three synthetic forms of vitamin K are vitamins K3, K4, and K5, which are used in many areas, including the pet food industry (vitamin K3) and to inhibit fungal growth (vitamin K5). Vitamin K1, the precursor of most vitamin K in nature, is a steroisomer of phylloquinone, an important chemical in green plants, where it functions as an electron acceptor in photosystem I during photosynthesis. For this reason, vitamin K1 is found in large quantities in the photosynthetic tissues of plants (green leaves, and dark green leafy vegetables such as romaine lettuce, kale and spinach), but it occurs in far smaller quantities in other plant tissues (roots, fruits, etc.). Iceberg lettuce contains relatively little. The function of phylloquinone in plants appears to have no resemblance to its later metabolic and biochemical function (as "vitamin K") in animals, where it performs a completely different biochemical reaction. Previous theory held that dietary deficiency is extremely rare unless the intestine (small bowel) was heavily damaged, resulting in malabsorption of the molecule. Another at-risk group for deficiency were those subject to decreased production of K2 by normal intestinal microbiota, as seen in broad spectrum antibiotic use. Taking broad-spectrum antibiotics can reduce vitamin K production in the gut by nearly 74% in people compared with those not taking these antibiotics. Diets low in vitamin K also decrease the body's vitamin K concentration. Those with chronic kidney disease are at risk for vitamin K deficiency, as well as vitamin D deficiency, and particularly those with the apoE4 genotype. Additionally, in the elderly there is a reduction in vitamin K2 production. Recent research results also demonstrate that the small intestine and large intestine (colon) seem to be inefficient at absorbing vitamin K supplements in rat populations low in Vitamin K. These results are reinforced by human cohort studies, where a majority of the subjects showed inadequate vitamin K amounts in the body. This was revealed by the presence of large amounts of incomplete gamma-carboxylated proteins in the blood, an indirect test for vitamin K deficiency. And in an animal model MK-4 was shown to prevent arterial calcifications, pointing to its potential role in prevention of such calcification. In this study vitamin K1 was also tested, in an attempt to make connections between vitamin K1 intake and calcification reduction. Only vitamin K2 (as MK-4) was found to influence warfarin-induced calcification in this study. The U.S. Dietary Reference Intake (DRI) for an Adequate Intake (AI) of vitamin K for a 25-year old male is 120 micrograms (μg) per day. The AI for adult women is 90 μg/day, for infants is 10–20 μg/day, and for children and adolescents 15–100 μg/day. To get maximum carboxylation of osteocalcin, one may have to take up to 1000 μg of vitamin K1. Phylloquinone (K1) or menaquinone (K2) are capable of reversing the anticoagulant activity (incorrectly but colloquially referred to as "blood-thinning action") of the powerful anticoagulant warfarin (tradename Coumadin). Warfarin works by blocking recycling of vitamin K, so that the body and tissues have lower levels of active vitamin K, and thus a deficiency of the active vitamin. Supplemental vitamin K (for which oral dosing is often more active than injectable dosing in human adults) reverses the vitamin K deficiency caused by warfarin, and therefore modulates or totally reverses the intended anticoagulant action of warfarin and related drugs. Foods containing high amounts of vitamin K (green leafy vegetables) are avoided when taking warfarin . Sometimes small amounts of vitamin K (one milligram per day) are given orally to patients taking Coumadin so that the action of the drug is more predictable. The proper anticoagulant action of the drug is a function of vitamin K intake and drug dose, and (due to differing absorption) must be individualized for each patient. The action of warfarin and vitamin K both require two to five days after dosing to have maximum effect, and neither Coumadin or vitamin K shows much effect in the first 24 hours after they are given. In two separate studies in the rat model, after long term administration of Coumadin to induce calcification of arteries in the rodents, supplemental vitamin K was found to reverse or prevent some of the arterial calcification attendant on the long-term blockade of vitamin K. A second study found that only vitamin K2 as MK-4, and not vitamin K1 was effective at preventing warfarin-induced arterial calcification in rats, suggesting differing roles for the two forms of the vitamin in some calcium-dependent processes. The newer anticoagulants dabigatran and rivaroxaban have different mechanisms of action that do not interact with vitamin K, and may be taken with supplemental vitamin K.
Vitamin K1 is found chiefly in leafy green vegetables such as dandelion greens (which contain 778.4 μg per 100 g, or 741% of the recommended daily amount), spinach, swiss chard, and Brassica (e.g. cabbage, kale, cauliflower, broccoli, lettuce, and brussels sprouts) and often the absorption is greater when accompanied by fats such as butter or oils; some fruits, such as avocado, kiwifruit and grapes, are also high in vitamin K. By way of reference, two tablespoons of parsley contain 153% of the recommended daily amount of vitamin K. Some vegetable oils, notably soybean, contain vitamin K, but at levels that would require relatively large calorific consumption to meet the USDA-recommended levels. Colonic bacteria synthesize a significant portion of humans' vitamin K needs; newborns often receive a vitamin K shot at birth to tide them over until their colons become colonized at five to seven days of age from the consumption of their mother's milk. Phylloquinone's tight binding to thylakoid membranes in chloroplasts makes it less bioavailable. For example, cooked spinach has a 5% bioavailability of phylloquinone, however, fat added to it increases bioavailability to 13% due to the increased solubility of vitamin K in fat. Food sources of vitamin K2 include fermented or aged cheeses, eggs, meats such as chicken and beef and their fat, livers, and organs, and in fermented vegetables, especially natto, as well as sauerkraut and kefir. Vitamin K2 (menaquinone-4) is synthesized by animal tissues and is found in meat, eggs, and dairy products. Menaquinone-7 is synthesized by bacteria during fermentation and is found in fermented soybeans (natto), and in most fermented cheeses. In natto, none of the vitamin K is from menaquinone-4, and in cheese only 2–7% is. Average diets are usually not lacking in vitamin K, and primary deficiency is rare in healthy adults. Newborn infants are at an increased risk of deficiency. Other populations with an increased prevalence of vitamin K deficiency include those who suffer from liver damage or disease (e.g. alcoholics), cystic fibrosis, or inflammatory bowel diseases, or have recently had abdominal surgeries. Secondary vitamin K deficiency can occur in bulimics, those on stringent diets, and those taking anticoagulants. Other drugs associated with vitamin K deficiency include salicylates, barbiturates, and cefamandole, although the mechanisms are still unknown. Vitamin K1 deficiency can result in coagulopathy, a bleeding disorder. Symptoms of K1 deficiency include anemia, bruising, and bleeding of the gums or nose in both sexes, and heavy menstrual bleeding in women. Osteoporosis and coronary heart disease are strongly associated with lower levels of K2 (menaquinone). Vitamin K2 (MK-7) deficiency is also related to severe aortic calcification and all-cause mortality. Menaquinone is not inhibited by salicylates as happens with K1, so menaquinone supplementation can alleviate the chronic vitamin K deficiency caused by long-term aspirin use. Although allergic reaction from supplementation is possible, no known toxicity is associated with high doses of the phylloquinone (vitamin K1) or menaquinone (vitamin K2) forms of vitamin K, so no tolerable upper intake level (UL) has been set. Blood clotting (coagulation) studies in humans using 45 mg per day of vitamin K2 (as MK-4) and even up to 135 mg/day (45 mg three times daily) of K2 (as MK-4), showed no increase in blood clot risk. Even doses in rats as high as 250 mg/kg body weight did not alter the tendency for blood-clot formation to occur. Unlike the safe natural forms of vitamin K1 and vitamin K2 and their various isomers, a synthetic form of vitamin K, vitamin K3 (menadione), is demonstrably toxic. The U.S. FDA has banned this form from over-the-counter sale in the United States because large doses have been shown to cause allergic reactions, hemolytic anemia, and cytotoxicity in liver cells. The blood clotting factors of newborn babies are roughly 30 to 60% that of adult values; this may be due to the reduced synthesis of precursor proteins and the sterility of their guts. Human milk contains 1–4 μg/L of vitamin K1, while formula-derived milk can contain up to 100 μg/L in supplemented formulas. Vitamin K2 concentrations in human milk appear to be much lower than those of vitamin K1. Occurrence of vitamin K deficiency bleeding in the first week of the infant's life is estimated at 0.25 to 1.7%, with a prevalence of two to 10 cases per 100,000 births. Premature babies have even lower levels of the vitamin, so they are at a higher risk from this deficiency. Bleeding in infants due to vitamin K deficiency can be severe, leading to hospitalizations, blood transfusions, brain damage, and death. Supplementation can prevent most cases of vitamin K deficiency bleeding in the newborn. Intramuscular administration is more effective in preventing late vitamin K deficiency bleeding than oral administration. USA -- As a result of the occurrences of vitamin K deficiency bleeding, the Committee on Nutrition of the American Academy of Pediatrics has recommended 0.5 to 1.0 mg vitamin K1 be administered to all newborns shortly after birth. UK -- In the UK, vitamin K is administered to newborns as either a single injection at birth or three orally administered doses given at birth and then over the baby's first month. Controversy arose in the early 1990s regarding this practice, when two studies suggested a relationship between parenteral administration of vitamin K and childhood cancer, however, poor methods and small sample sizes led to the discrediting of these studies, and a review of the evidence published in 2000 by Ross and Davies found no link between the two. Both physiological and observational evidence indicate vitamin K plays a role in bone growth and the maintenance of bone density, but a large study attempting to delay the onset of osteoporosis by vitamin K supplementation proved ineffective. Vitamin K takes part in the post-translational modification as a cofactor in γ-carboxylation of vitamin K-dependant proteins (VKDPs). VKDPs have glutamate residues (Glu). Biophysical studies suggest that supplemental vitamin K promotes osteotrophic processes and slows osteoclastic processes via calcium bonding. Study of Atkins et al. revealed phylloquinone, menatetrenone (MK-4) and menadione promote in vitro mineralization by human primary osteoblasts. Other studies have shown vitamin K antagonists (usually a class of anticoagulants) lead to early calcification of the epiphysis and epiphysial line in mice and other animals, causing seriously decreased bone growth, due to defects in osteocalcin and matrix Gla protein. Their primary function is to prevent overcalcification of the bone and cartilage. Vitamin K is important in the process of carboxylating glutamic acid (Glu) in these proteins to gamma-carboxyglutamic acid (Gla), which is necessary for their function. Vitamin D is reported to regulate the OC transcription by osteoblast thereby showing that vitamin K and vitamin D work in tandem for the bone metabolism and development. Lian and his group discovered two nucleotide substitution regions they named "osteocalcin box" in the rat and human osteocalcin genes. They found a region 600 nucleotides immediately upstream from the transcription start site that support a 10-fold stimulated transcription of the gene by 1,25-dihydroxy vitamin D.
Data from the 1998 Nurses Health Study, an observational study, indicated an inverse relationship between dietary vitamin K1 and the risk of hip fracture. After being given 110 micrograms/day of vitamin K, women who consumed lettuce one or more times per day had a significantly lower risk of hip fracture than women who consumed lettuce one or fewer times per week. In addition to this, high intakes of vitamin D but low intakes of vitamin K were suggested to pose an increased risk of hip fracture. The Framingham Heart Study is another study that showed a similar result. Subjects in the highest quartile of vitamin K1 intake (median K1 intake of 254 μg/ day) had a 35% lower risk of hip fracture than those in the lowest quartile. 254 μg/day is above the US Daily Reference Intake (DRI) of 90 μg/day for women and 120 μg/day for men. In the face of this evidence, a large multicentre, randomized, placebo-controlled trial was performed to test the supplementation of vitamin K in postmenopausal women with osteopenia. Despite heavy doses of vitamin K1, no differences were found in bone density between the supplemented and placebo groups. MK-4 has been shown in numerous studies to reduce fracture risk, and stop and reverse bone loss. In Japan, MK-4 in the dose of 45 mg daily is recognized as a treatment for osteoporosis under the trade name Glakay. MK-4 has been shown to decrease fractures up to 87%. In the amount of 45 mg daily MK-4 has been approved by the Ministry of Health in Japan since 1995 for the prevention and treatment of osteoporosis. Menaquinone-7 (MK-7), which is abundant in fermented soybeans (natto), has been demonstrated to stimulate osteoblastic bone formation and to inhibit osteoclastic bone resorption. In another study, use of MK-7 caused significant elevations of serum Y-carboxylated osteocalcin concentration, a biomarker of bone formation. MK-7 also completely inhibited a decrease in the calcium content of bone tissue by inhibiting the bone-resorbing factors parathyroid hormone and prostaglandin E2. On 19 February 2011, HSA (Singapore) approved a health supplement that contains vitamin K2 (MK-7) and vitamin D3 for increasing bone mineral density. A study by Gast et al. (2009), reports "an inverse association between vitamin K(2) and risk of CHD with a Hazard Ratio (HR) of 0.91 [95% CI 0.85–1.00] per 10 μg/d vitamin K(2) intake. This association was mainly due to vitamin K(2) subtypes MK-7, MK-8 and MK-9. Vitamin K(1) intake was not significantly related to CHD. The authors conclude that "a high intake of menoquinones, especially MK-7, MK-8 and MK-9, could protect against CHD. However, more research is necessary to define optimal intake levels of vitamin K intake for the prevention of CHD." Research into the antioxidant properties of vitamin K indicates that the concentration of vitamin K is lower in the circulation of carriers of the APOE4 gene, and recent studies have shown its ability to inhibit nerve cell death due to oxidative stress. It has been hypothesized that vitamin K may reduce neuronal damage and that supplementation may hold benefits to treating Alzheimer's disease, although more research is necessary in this area. Vitamin K may be applied topically, typically as a 5% cream, to diminish postoperative bruising from cosmetic surgery and injections, to treat broken capillaries (spider veins), to treat rosacea, and to aid in the fading of hyperpigmentation and dark under-eye circles. While researchers in Japan were studying the role of vitamin K2 as the menaquinone-4 (MK-4) form in the prevention of bone loss in females with liver disease, they discovered another possible effect. This two-year study that involved 21 women with viral liver cirrhosis found that women in the supplement group were 90% less likely to develop liver cancer. A German study performed on men with prostate cancer found a significant inverse relationship between vitamin K2 consumption and advanced prostate cancer. In 2006, a clinical trial showed that K2 as the menaquinone-4 (MK-4) (called menatetrenone in the study) might be able to reduce recurrence of liver cancer after surgery. It should be noted that this was a small pilot study and other similar studies did not show much effect. MK-4 is now being tested along with other drugs to reduce liver cancer and has shown promising early results. A research shows that total diabetes risk of individual who have highest circulating levels of vitamin K1 were 51% lower than those with the lowest levels. The researchers conclude that dietary phylloquinone intake is associated with reduced risk of type 2 diabetes. A research shows that the risk of developing non-Hodgkin lymphoma was decreased by 45 percent for the study participants who had the highest vitamin K levels compared to participants with the lowest levels of the vitamin. Vitamin K is an antidote for poisoning by 4-hydroxycoumarin anticoagulant drugs (sometimes loosely referred to as coumarins). These include the pharmaceutical warfarin, and also anticoagulant-mechanism poisons such as bromadiolone, which are commonly found in rodenticides. 4-Hydroxycoumarin drugs possess anticoagulatory and rodenticidal properties because they inhibit recycling of vitamin K and thus cause simple deficiency of active vitamin K. This deficiency results in decreased vitamin K-dependent synthesis of some clotting factors by the liver. Death is usually a result of internal hemorrhage. 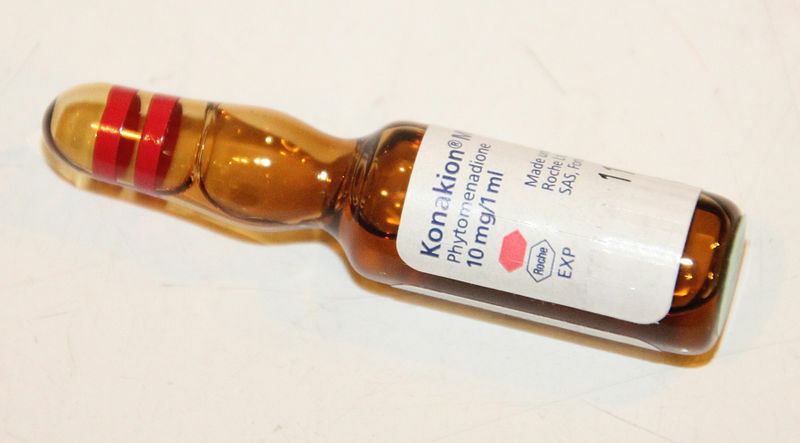 Treatment for rodenticide poisoning usually consists of repeated intravenous doses of vitamin K, followed by doses in pill form for a period of at least two weeks, though possibly up to 2 months, after poisoning (this is necessary for the more potent 4-hydoxycoumarins used as rodenticides, which act by being fat-soluble and thus having a longer residence time in the body). If caught early, prognosis is good even when great amounts of the drug or poison are ingested, as these drugs are not true vitamin K antagonists, so the same amount of fresh vitamin K administered each day is sufficient for any dose of poison (although as noted, this must be continued for a longer time with more potent poisons). No matter how large the dose of these agents, they can do no more than prevent vitamin K from being recycled, and this metabolic problem may always be simply reversed by giving sufficient vitamin K (often 5 mg per day) to ensure that enough fresh vitamin K resides in the tissues to carry out its normal functions, even when efficient use of it by the body is prevented by the poison.